Nemacolin, named to honor an Indian chief of local historical note, is spread out across some 2000 acres of rolling hills and deep forest containing three hotels (the Lodge, the Versailles-themed Chateau, and the even more upscale Falling Rock, which was designed by a Frank Lloyd Wright-trained architect and reminiscent of the master’s legendary “Fallingwater,” located nearby). One can also rent townhomes, “luxury homes,” and even space in an RV park. On the five star/five diamond property there are nine restaurants, the state’s largest private wine cellar (25,000 bottles, at last count), both vintage car AND vintage planes museums, an all amenities spa, a pet spa (featuring individual suites with flat-screen TVs and orthopedic beds and –not just dog-walkers- “Wooflands” has staff swimmers who dog-paddle along with your pampered pooch in a private pool. Of course, cats are catered-to as well at the “Kitty Condo.”), two golf courses of which one is PGA Championship-rated, all kinds of indoor and outdoor sports (a ropes course, climbing wall, archery range, skiing, etc. ), day care (which offers a dinosaur bone dig excavation expansion of your basic sandbox concept), an indoor shopping mall fabricated to look like an outdoor street, a saltwater aquarium, a zoo, a soon-to-be-completed casino and a museum-class art collection. Got the picture? If not, then Mr. Hardy probably does among the $50,000,000 worth of paintings, sculptures, photographs and decorative objects that he’s amassed. 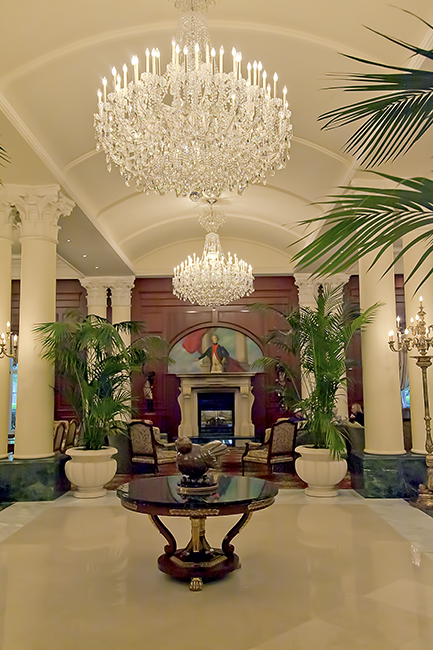 Lobby, Chateau Lafayette, Nemacolin Woodlands Resort, inspired by the famed Ritz Paris in France.During a tour of the galleries, grounds, gardens and halls of Nemacolin, I learned about many of the pieces in the collection and heard a few stories about the agglomerating methods of their owner. Collectors generally start out buying what they like, then progress beyond enthusiastic naiveté and learn from their earlier mistakes along the way. Hardy was no different except that, when he saw pieces he liked, he could ––and sometimes did– purchase all of the particular creator’s output. 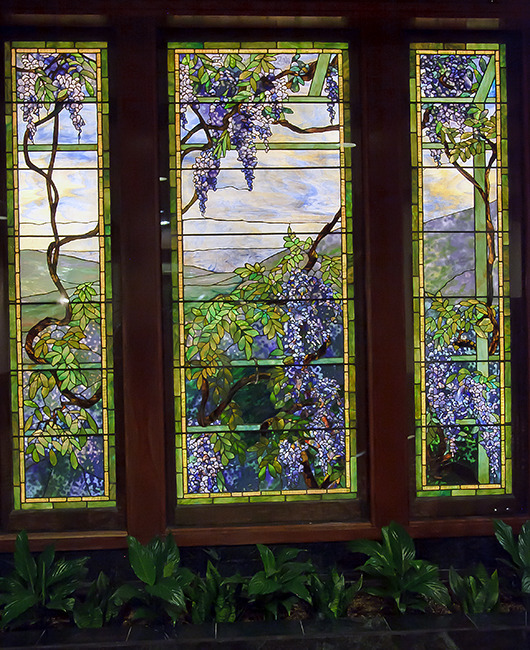 A few of these works still adorn the walls of the resort, alongside opuses by Picasso, Lautrec, and Calder. Maybe the underlying truth of the collection mirrors the philosophy frequently expressed about wine, “Drink what you like.” After all, who are the critics? What makes them so special: education? They know artists from the past, but does that qualify one to evaluate their contemporaries? Learning from the past isn’t a guarantee that you’ll be prepared to evaluate your contemporaries. Van Gogh sold nothing during his short life, Lautrec was undervalued, and photography was regarded as a near worthless craft at its inception. So what if the customer, even an untutored one, is right? And here we go with the “what ifs” again–– What if you bought a painting from an unknown artist, maybe even an unfashionable or reviled one and, over time, the painter turned into a celebrity and the work became valuable? (Think Warhol, whose pieces Hardy has in the collection.) Sometimes it’s the mere act of garnering a high price that confers status and dignity on an artist or a piece. I can walk into a Santa Fe gallery and see something that I don’t even recognize as art. That is, until I read that the author hangs in the permanent collection of the Louvre or am told that he or she is collected by Brad Pitt. Then you’ve got yourself some bona fide Art! 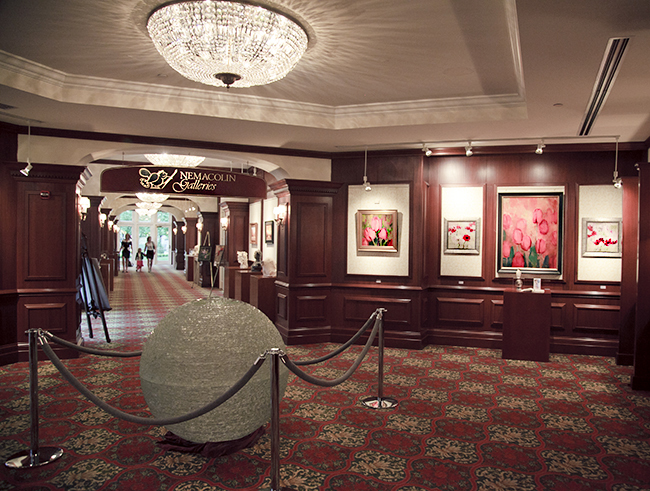 Nemacolin Art Galleries, dedicated to sharing the talents of local, regional and international artists. If I had money, I could be that tastemaker. Perception street runs both ways, some artworks have astronomically escalated in value, while others have meteorically plummeted. But what fun it’d be to floor a sports car down that private street! And it would be even more mirthful to intentionally buy some bad art, as an experiment in psychology, just to see what happens. Maybe that’s what Hardy is doing by a presenting a kitschy bronze department store manikin next to an Oldenburg? (At New Zealand’s now world-famous MONA, David Walsh created an entire museum whose intent seems to be to metaphysically thumb its nose at the pretentions of the art world.) 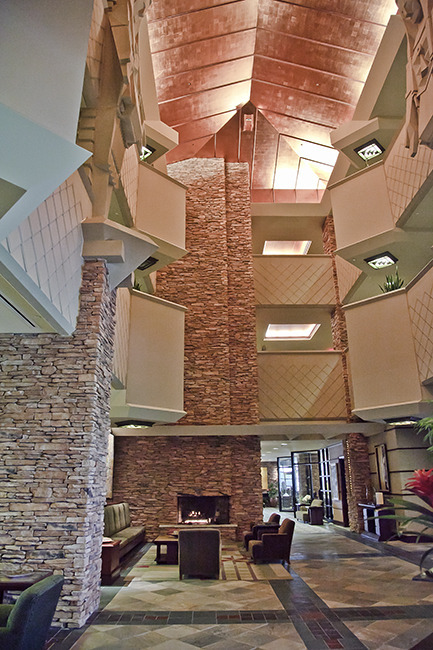 The sales gallery at Nemacolin offers no conclusive clue as to a possible furtive purpose. Local artists are featured on consignment but, when I toured, the pieces on display tended toward the conservative: landscapes, still lifes, portraiture rendered in realistic or belle epoch impressionistic styles. The selection seems geared towards a broad demographic, a buying public, folks on vacation. It’s not necessarily reflective of the penchant of the establishment’s owner. So that leaves me where I started–– trying to figure Hardy out and then, second-guessing what I might buy and display, given similar economic opportunity. As previously alluded-to, I live in Santa Fe, New Mexico. It’s America’s third largest art market and, consequently, I know quite a few artists. Would I buy locally and maybe even let my heart rule my head or investment wallet? Would I seek to acquire established names? Would I do anything at all, or would acquisitioning be the assigned duty of a curator? If so, with the exception of actual ownership, would the collection truly be mine? And what about changing tastes? I think my personal preferences would alter and, hopefully, evolve over time. For instance, do you still like that “must read” book of just a few years ago? So, given the gift of limitless wealth, what art would I buy? I’d like to think that have a refined palate. But what if I’m wrong? Who says I’m wrong? Would I even care what “they” say? And what if time proves me right?